LOS ANGELES — Following extensive October 2018 overviews of public radio news/talk and Major League Baseball flagships, we turn our attention to stations in the country format; waiting on deck is our thorough examination of (commercial) news/talk. Breakouts shown here consist of data from country-formatted properties that rank in the top 20 in any PPM-market (6+, October 2018). Over and above that particular ratings caveat, Nielsen Audio only releases audience estimates for stations that subscribe to its services. 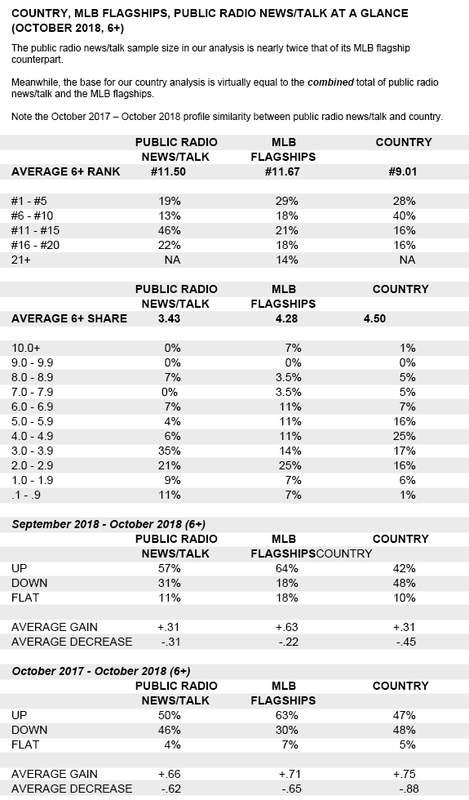 Thus, ratings stats in this analysis are limited to facilities that pay Nielsen Audio for its data.